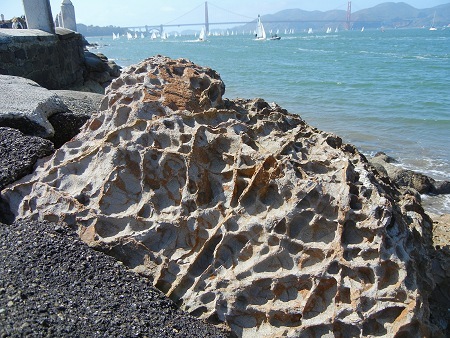 San Francisco does a few geological things better than Oakland. Here’s one. Salt air, specifically salt spray, causes this dramatic pitting in sandstone of the breakwater out by the Golden Gate Yacht Club, on the way to the Wave Organ. San Francisco simply gets more of that raw sea wind that splashes seawater onto the rocks. As the brine dries out, salt crystals grow in the pore spaces and gradually pry the mineral grains apart. This process, called cavernous or honeycomb weathering, affects inland sites where the rock itself contains some salt (Mount Diablo and Las Trampas Ridge have good examples), but along the coast it acts much faster and more pervasively. The hollows are often called tafoni, however that term is properly used for large hollows. Little ones are called alveoli. You might see some of this in Oakland rocks, but only down in the port, if there. I can’t think of a good example. The riprap boulders in our port are mostly hard igneous rocks that are much more impervious to water. This entry was posted on 11 May 2014 at 9:50 pm and is filed under Other topics. You can follow any responses to this entry through the RSS 2.0 feed. You can skip to the end and leave a response. Pinging is currently not allowed.